As the semester winds down and finals loom ahead, students may be looking for ways to escape campus. Luckily, there are plenty of destinations and activities for Butler students to explore, especially around the holidays. Downtown Indianapolis offers one of the country’s best light displays on one of the biggest Christmas trees in the world. It is located in Monument Circle at the intersection of Meridian and Market Streets. This year’s display features 4,784 lights and 52 garland strands on a 242-foot display. It is also the first time LED bulbs are being used. There is no cost to see the lights, which runs until Jan. 12. Christmas at the Zoo is a tradition that is over 50 years old and features activities for the whole family. The Indianapolis Zoo was the first zoo to hold a holiday lights exhibit. Things to do range from meeting penguins to visiting the tunnel of lights. The zoo is open extended hours on Fridays and Saturdays as well open on Tuesdays and Wednesdays through the holiday season until Dec. 30. Admission varies depending on day. A recent addition to the Indianapolis slate of winter activities, Winterlights at Newfields is a dazzling display of Christmas light featuring over 1.5 million lights on the Lilly House lawn. 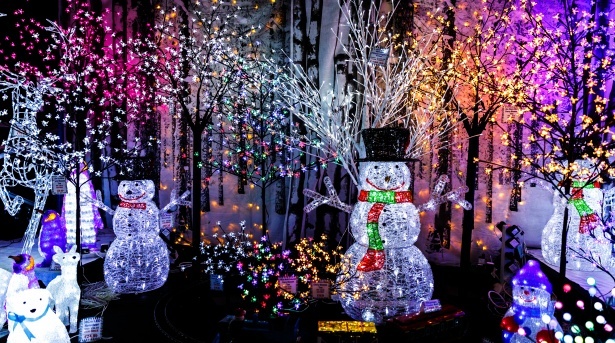 The light show is coordinated with Christmas music which makes it unique from other displays around town. There are an array of warm and cold beverages to enjoy while walking through the light display. This light display runs through Jan. 6. Butler students get free admission to Newfields with their school ID. This German-style Christmas market in downtown Carmel features a variety of German-style dishes and beverages. There are also arts and crafts vendors located throughout the village and live music plays while people ice skate in the middle of the market. It is open Wednesday and Thursday from 4 to 9 p.m. and Friday through Sunday noon to 9 p.m., ending on Dec. 23. Jingle Rails is a display of toy trains with nine working model trains winding through miniature versions of historic American landscapes. There are miniature versions of locations around Indianapolis like Lucas Oil Stadium and Monument Circle. This year features a new display of the historic Route 66. The display is open until Jan. 21 and costs $13 in advance or $15 at the door. The display is open Monday through Saturday 10 a.m. to 5 p.m. and Sunday noon to 5 p.m.
With over three million lights displayed on a two-mile course, Lights at the Brickyard is a unique experience. The course spreads through the infield and oval track, including the front stretch and the famous yard of bricks across the start and finish line. It runs through Dec. 30. On Monday through Wednesday, the price is $25 per car load, and it’s $30 Thursday through Sunday. These tickets may only be purchased at Gate 2.